This BlueSky Organics Craft Kit contains everything you need (seeds & soil sold separately) to grow four high quality, pure, clean and potent flower plants or produce at home. Organic inputs mean organic outputs. Grow top notch organic and aromatic plants. Our award winning system is scientifically proven to grow some of the most potent & organic produce. Super Soil sold separately. Check here for a retailer near you or be sure to add our Organic Super Soil to your cart. Note: Seeds are not included in the Organic Craft Grow Kit. Please be sure to check our retail partners to where you might find them. 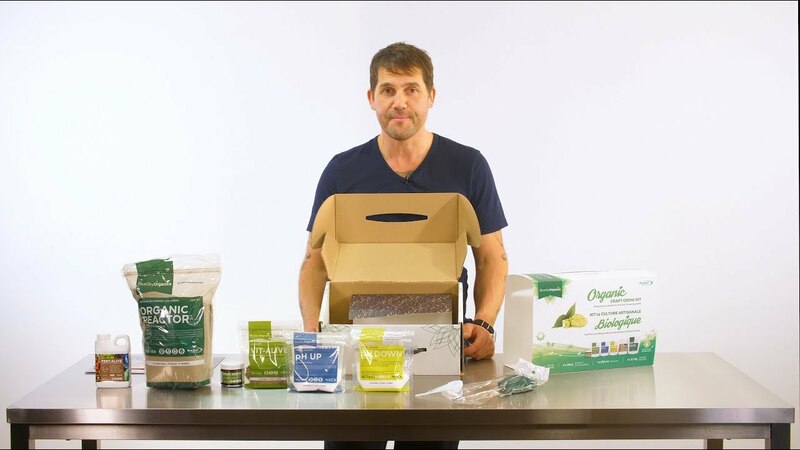 The BlueSky Organics Organic Craft Kit – allows you to grow four legal plants at home with all the essential products that you need to grow some of the highest quality, pure, clean and optimal organoleptic qualities possible in your produce, fruit or flower plants. All our products are 100% certified organic and lab-tested by our master growers. Our award-winning process is first of its kind in Canada. Simply follow our 4 step process to produce the highest quality yield for four flowering plants or produce. Fert-Alive™ – organic and enzymatic fertilizer that promotes the growth of beneficial microorganisms and improves nutrient uptake. By using organic, non-GMO accelerated cold hydrolysis, our formula locks in the enriching nutrients in the organic material; allowing delivery of superior nutritional value to the plant and soil. Organic Reactor™ – promotes superior blooming for all your bud, flower and fruit producing plants. It also provides an excellent source of magnesium and calcium. Our ready to use Organic Reactor™ is a highly beneficial soil amendment which improves soil vitality and overall plant health. Organic Booster™ is a carbohydrate infused booster that is rich in nutrients which stimulate microorganisms with a chelating agent, adding a naturally occurring flavour profile. Booster™ is 100% plant soluble, promotes fast absorption, and is a non-burning product. pH Up – uniquely natural pH adjuster used in balancing water pH levels, without affecting the beneficial microbes and microorganisms. pH Up is an all natural, non-burning formula. pH Down – uniquely natural pH adjuster used in balancing water pH levels, without affecting the beneficial microbes and microorganisms. pH Down is an all natural, non-burning formula. Moisture Meter & Measuring Spoons – We include some tools to track your plants and help them grow better. Instructions – the most comprehensive step by step instructions for growing. The BlueSky Organic Super Soil – Sold separately. Check here for a retailer near you or be sure to add our Organic Super Soil to your cart.